We are deeply grateful to all of our sponsors. We cannot create and drive our strong programs without your support. 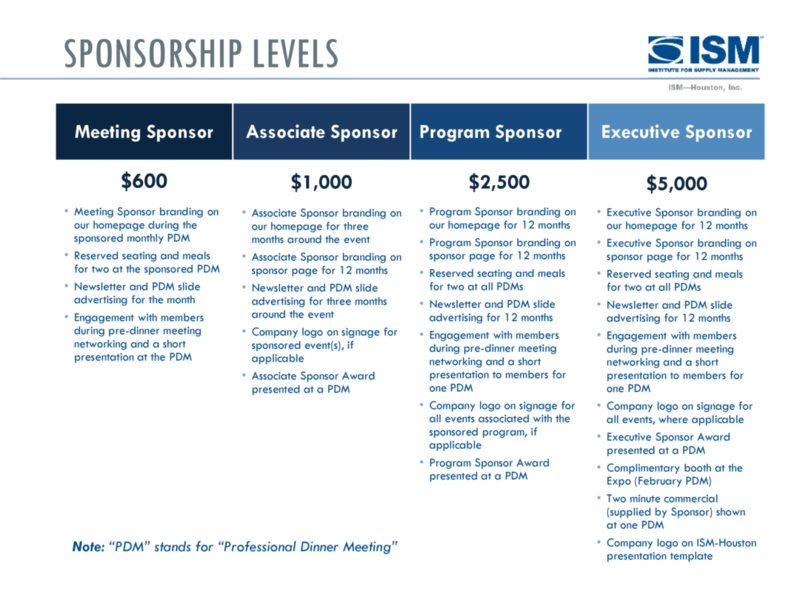 ISM-Houston offers many sponsorship opportunities including Meeting (for our Profession Dinner Meetings or PDMs) Associate, Program and Executive sponsorships. Sponsorship costs and benefits can be found in the matrix below. ISM-Houston also sponsorship opportunities for single events, our annual Expo in February and our annual Golf Tournament in May. Sponsors are also recognized for in-kind contributions, such as use of facilities and catering for our events. Please see our Sponsor tabs for a list of our current sponsors. ISM-Houston is a 501(c)(6) organization, so contributions are not tax deductible by the donor. However, contributions to a 501(c)(6) may be deductible as a business expense by the donor. Please consult your tax advisor. For information relating to any of these sponsorship opportunities, or to pursue a sponsorship, please contact Bob Schneider, Fundraising and Special Activities, at +1 (713) 703-6979 or bob.schneider@ism-houston.org.